how you unknowingly sabotage your own success. The Rebel, driven by confidence. The Explorer, fueled by intention. The Truth Teller who embraces candor. The Hero who embodies courage. The Inventor, brimming with integrity. The Navigator who trusts and is trusted. The Knight for whom loyalty is everything. What is your Leadership Gap? with their mind because they self -doubt. just so you will not know how powerless they really feel. they cannot trust themselves to speak the truth. too conservative to take a risk, and to cautious to take a stand. great ideas die than get credit for them. The Fixer who is arrogant and a chronic rescuer no one trusts. before those of the team, the business or the organization. offered to those who leverage their gaps. With over three decades of experience, Lolly Daskal is one of the most sought after executive leadership coaches and business consultants worldwide. Her extensive cross-cultural expertise spans several continents. Lolly works with a blue-chip roster of clients, from c-suite executives in Fortune 500 companies to government leaders, to entrepreneurs, to nonprofits. She serves organizations of all sizes in a wide-range of industries including energy, pharmaceutical, technology, and finance. She brings her expertise to her work that is grounded in behavioral and psychological principles. Lolly has received many honors and accolades including being named one of the Top 50 Leadership and Management Experts on Inc. Magazine. American Management Association called her the Leader to Watch and the Huffington Post named Lolly the most inspiring woman in the world. 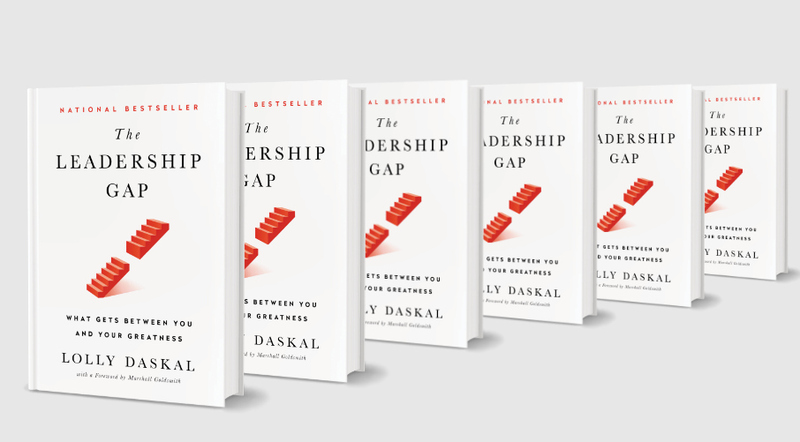 The Leadership Gap was written for you. and those you know with leadership potential. Wishing all the greatness you deserve, thank you for all your support.